We’re Giving Seminars at the Hamilton Spring RV Expo! If you have not had a chance to hear and experience one of our seminars before then you are in for a treat (at least we think so). Rob Lowe will be presenting four informative PowerPoint presentations in a seminar format each day during the Hamilton Spring RV Expo. The show runs Friday January 22nd through Saturday, January 23rd and concludes on Sunday, January 24th. From A to ZZzzzz …The Alphabet for RVer’s: Answers to YourRV Questions. This seminar focuses on many questions RVers have about their RV. I will try to provide answers. In addition, there is a safety aspect to RVing that often gets lost in the excitement to get out and RV. We use the Alphabet to ‘hang’ the information off of, making it is easier to remember. Another seminar which has been very popular recently is the ABCs of L.E.D.s which provides an introduction to converting your RV to L.E.D. lighting. Rob has written an eBook of the same name and he will present a lot of the information contained in this book. It is aimed at reducing the clutter of information about the topic and will provide you with a great overview of L.E.D. lighting no matter what the setting. 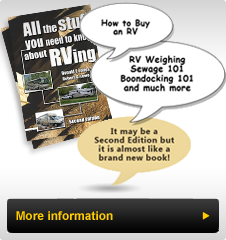 This seminar has been presented at many RV Rallies and RVer’s have found it very informative. In addition, he will have product displays including lighting comparison displays that will help guide you through the transition. Before you invest in making the conversion, learn about the benefits and what to expect, as well as how to avoid some of the pitfalls. Our experience in the industry can provide valuable insight into the topic. The third seminar is entitled: Three Common RV Maintenance Issues & How to Resolve Them Over the years RV’s have improved and changed. Some things that contribute to enjoyment when things go well and frustration when they don’t have not changed. Come to this seminar and learn some simple things you can do and what to watch out for as you enjoy RVing. This Seminar was created specifically for the RV Expo – Come and Learn. As always there will be a Question and Answer Session following the presentation. Have you ever thought of taking the Ultimate RVing Adventure? Alaska, Yukon, Northern BC and Alberta offer expansive vistas, wild life and beauty unmatched anywhere in North America. Rob and his wife Jane enjoyed a 3-1/2-month RV trip during the summer of 2015. This fourth seminar will cover some of the things to see, some of the myths and truths of taking this RV trip and hopefully provide you with the knowledge and encouragement to Go RVing to this wonderful corner of North America. The Spring RV Expo is being held at the Canadian Warplane Heritage Museum, beside the Hamilton Airport, just off Highway 6 South, minutes from the 403. There will be both Travel Trailers and Motorized RV’s on display inside and each will be open for you to take a look. 3. Alaska & Western Canada by RV ­­-- What an Adventure! We have planned to allow time after each seminar presentation for questions and answers so you can bring you questions and pose them either during the time allotted at the Seminar or come to our area where you can ask Rob there. We will have copies of our popular book "All the Stuff You Need to Know about RVing” and Rob will be signing copies for all who buy one. Buy your tickets online and save $2.00 per ticket. Navigate from the link above to the Buy Tickets now link.